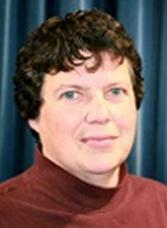 Mick MacLean (Buffalo State) emailed me with an interesting problem. When you’re teaching in a classroom without an easily visible clock or an easily visible but inaccurate clock, getting class started and ended on time is a challenge. He thought this might be a problem technology could fix. He wanted an alarm of some kind to sound at the beginning class, with five minutes left, and then at the end of class. Ideally this would happen all on its own without his having to remember to set alarms. Here’s the solution for Android users. 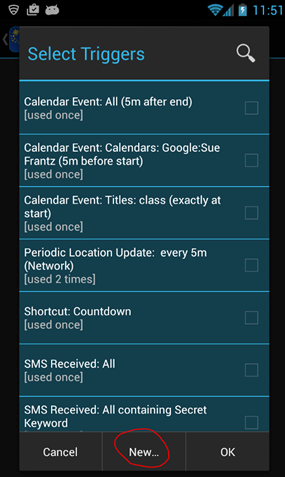 We’re going to have your Android device read your Google Calendar. When your Google Calendar says that it is time for Psych 100 to start or end, the device will emit a sound and then turn off on its own. From Google Play, download Automagic to your phone or tablet. Here are instructions on how to set a “begin class” and a “2-minute warning” alarm. When you run Automagic on your mobile device, tap the three-dot menu icon. 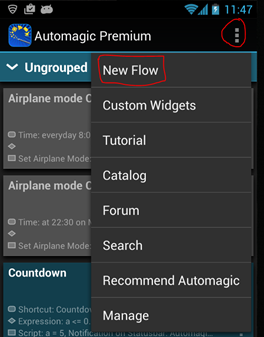 Select “New Flow”. 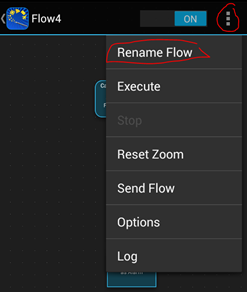 Flow is the term Automagic uses for these little programs that you can create to make your Android device do just about anything you want short of washing your underwear. A box will appear. 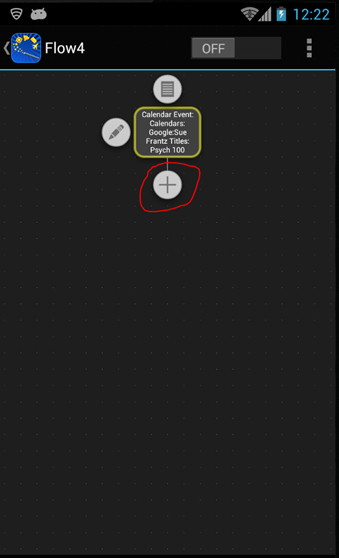 Tap the box, then tap the lined-paper icon that will appear above it. Select “new” at the bottom of the screen. This will create a new trigger. Let’s do a quick recap. I have created a trigger. 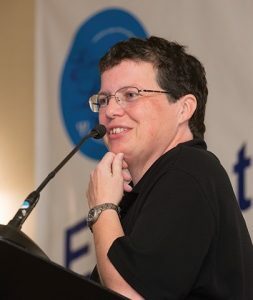 When Automagic sees that it is zero minutes before an event called Psych 100 in my Sue Frantz Google Calendar or 2 minutes before the end of that event, Automagic will… do something. I haven’t told it what yet. 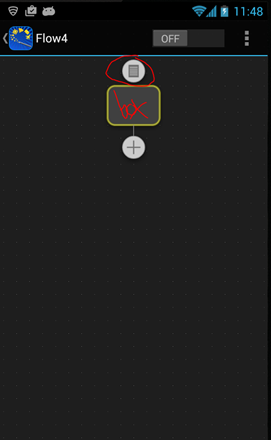 Tap “Save” at the top of the Automagic screen. This takes you back to the flow screen. Tap and drag the plus sign icon down and release it. Select “Action”. Scroll way down. And I mean way down. As you scroll take a look at some of the actions Automagic can do. 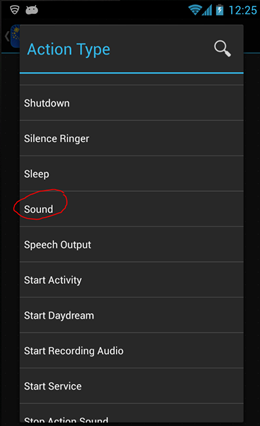 Select “Sound”. Tap “Save.” You’re back on the main flow page. 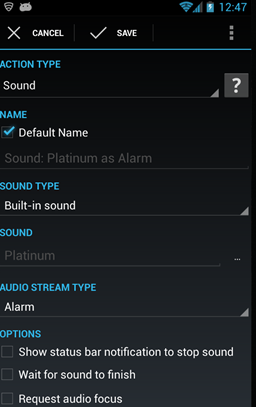 I chose “Begin and end class alarm.” If the on/off switch is set to off, slide it to on. 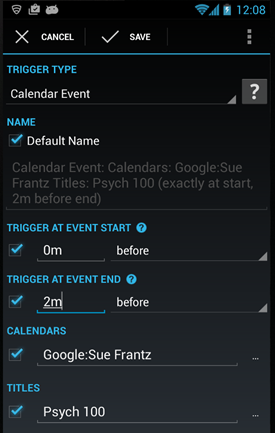 Try it out by setting a calendar event with the appropriate title just a few minutes from now. 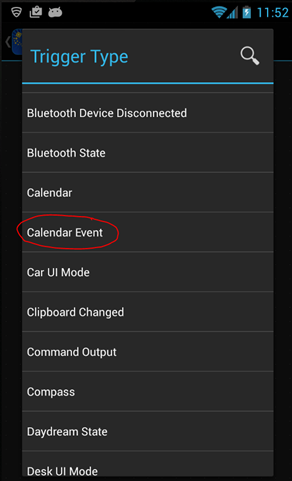 Leave at least two minutes between when you set the calendar event and when you expect the phone’s alarm to go off. Of course this flow will sound the same alarm at the start of class and again with two minutes left. 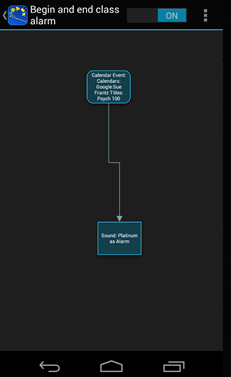 If you want a different sound for the beginning and the two-minute warning, or if you want another sound for the very end of class, create additional flows. If your classroom is big and there is a setup for laptops, you can plug the audio cable designed for laptops into your phone’s headphone jack. When your phone plays, the sound will go through the classroom’s speakers. Just make sure the speakers are turned up. I don’t even think about the flows I have any more. I mentioned above that when my calendar says I’m busy, my phone is set to silent. When the “busy” event it over, the ringer comes back on. In that same vein, my phone is automatically silenced at 9pm and the ringer comes back on at 8am. When I am at home or at work (by GPS location), my phone’s wifi is turned on. When I leave, my phone’s wifi is turned off. 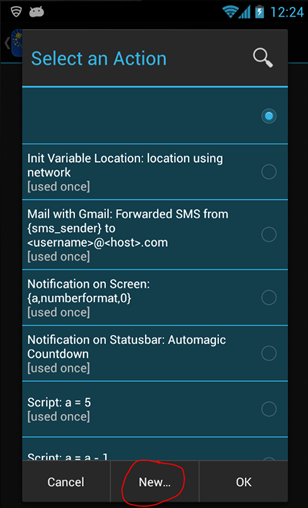 Anything you ask your Android device to do on a routine basis can be automated.